The 47th Street exit on the outbound Dan Ryan Expressway closed early Thursday after a semi-truck carrying 42,000-pounds of powered milked jackknifed over the cement wall. 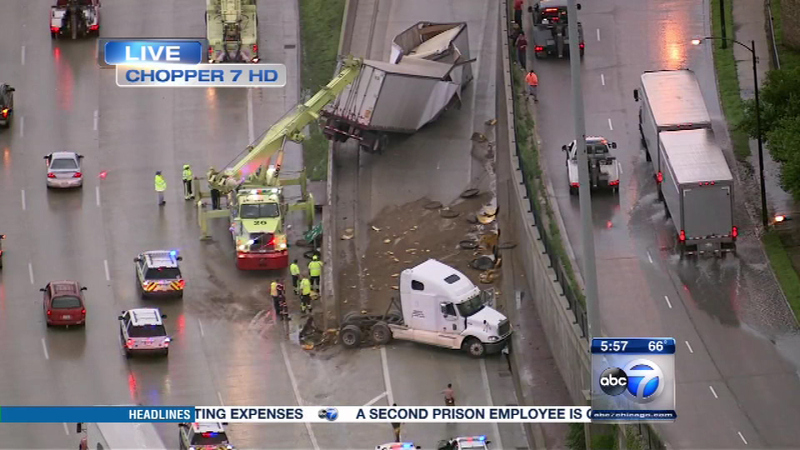 CHICAGO (WLS) -- The 47th Street exit on the outbound Dan Ryan Expressway was closed for hours early Thursday after a semi-truck carrying 42,000-pounds of powered milked jackknifed over the cement wall. The ramp and right lanes were closed at about 5 a.m., but all lanes reopened. The exit ramp remained closed as Chicago area rush hour began until about 11 a.m. The driver was transported to Holy Cross Hospital in Chicago with non-life-threatening injuries, officials said. The semi-truck's cab separated from the rest of the trailer and several emergency trucks worked to remove debris. The truck knocked out 10-12 traffic barrels as well as the exit signs, officials said.